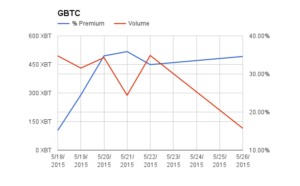 GBTC trading volume nose dived to 115 XBT. 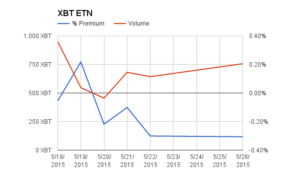 The product is losing steam vs. its European competitor XBT. 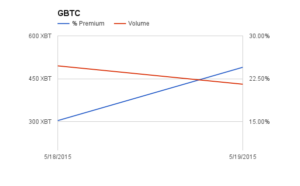 The premium stayed flat at 35%. XBT had its second biggest volume day at 756 XBT yesterday. 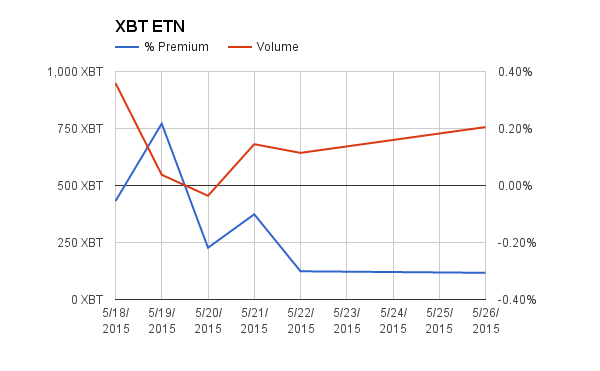 The ETN continues to trade at a slight 0.30% discount to fair value. Yesterday XBT Provider AB a subsidiary of KnC Group (a large miner) launched the world’s first ETN (Exchange Traded Note) with a Bitcoin underlying. Bitcoin Tracker One tracks the equally weighted Bitcoin / USD price on Bitfinex, Bitstamp, and OKCoin. The ETN trades in SEK on the Nasdaq OMX Nordiq. Trading volume on the first day went gangbusters. There is some confusion about how to convert the turnover figures listed into a Bitcoin equivalent number. On the exchange website, the turnover in SEK is listed, which was 1,837,196 SEK. Take this figure and divide by the price, 9.73 SEK to get shares. Approximately 188,817 shares were traded (it’s approximate because the exchange lists turnover instead of shares traded). 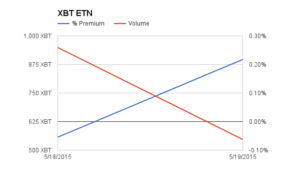 The ETN provider specifies that each share is worth 0.005 Bitcoin. Which means 944 Bitcoin equivalent shares were traded on the first day. 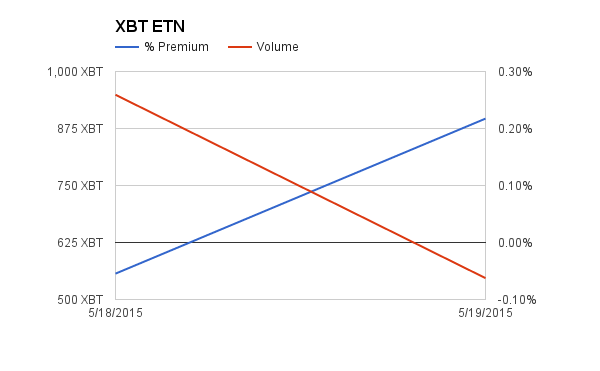 The next crucial factor is the premium or discount to intrinsic value at which the ETN traded. The exchange closes at 16:15 GMT + 0 each day. The closing price was 9.73, the Bitcoin / USD price at that time was 236.54 Bitfinex, 236.45 Bitstamp, and 236.34 OKCoin for an average price of 236.44. The Bloomberg SEK/USD rate is 8.2348. That equates to a per share intrinsic value of 235.44 * 8.2348 * 0.005 = 9.735, and a 0.05% discount. That is tight, the market maker is doing their job correctly. 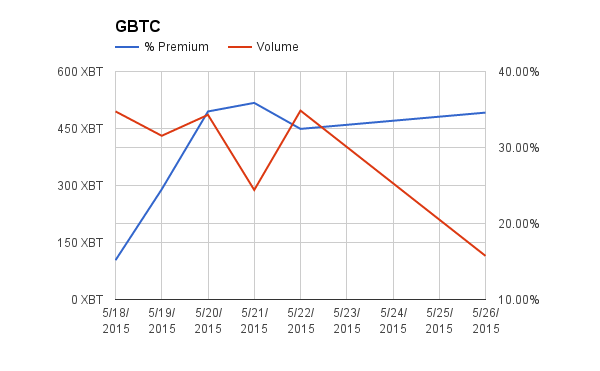 Why is GBTC’s premium multiples of Bitcoin Tracker One’s? The structure of an ETN allows the market maker to create and redeem shares at will to keep the premium or discount in line. GBTC shares cannot easily be created, it takes a minimum of one year to create new shares. It is also practically impossible to short GBTC. With an ETN, the market maker can have a negative inventory and at the end of the trading day create more shares to deliver to buyers within the settlement timeline. This is indeed a very successful launch of a new ETN. 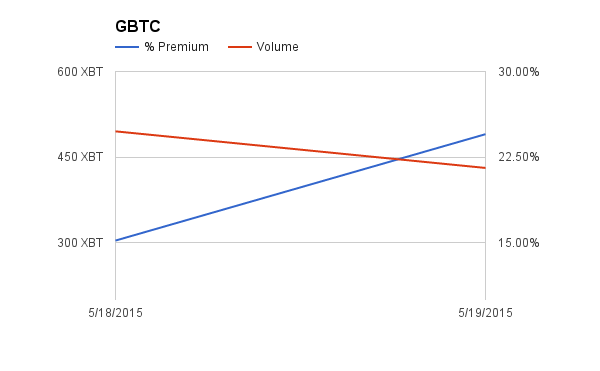 As the broader market learns of the liquidity and affordability of this product, trading volumes should grow faster than that of GBTC. The only issue is that any holders bear KnC Group credit risk. But if the first day’s trading is any guide, market participants are more than happy to shoulder that risk for an easier way to gain Bitcoin exposure.